If you’re wondering how to make nitro coffee, you’re likely already making cold brew. As with any food or beverage, good nitro coffee will start with good ingredients so make sure you’re using a coffee that you enjoy before you begin trying to make your own nitro coffee. If you landed here by mistake and don’t know what nitro coffee is, check out this earlier post: What is Nitro Coffee. So if it’s not apparent, nitro coffee starts with cold brew coffee. 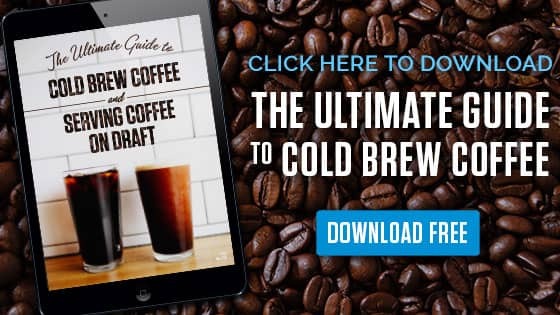 If you don’t already make your own cold brew, you can check out this quick primer on how to make cold brew coffee to serve on draft. From 2015 to 2017, cold brew coffee sales increased by 370% from $8.1 million to $38.1 million (according to Statista) and nitro coffee sales made up a large portion of that increase. The remainder of this post is going to assume that you already have cold brew made that you’ll be turning into nitro coffee. That cold brew could come in the form of a concentrate that you dilute or it might be a cold brew that you brewed specifically to make nitro coffee from. Nitro coffee will require 2 things – 100% pure, food grade nitrogen and an agitator or restrictor plate to agitate the nitrogen in the coffee as it is being poured/served. There are a few other components that will be necessary, but these two components are what give nitro coffee its distinctive taste and appearance. I will note that there are many tutorials out there that suggest that nitro coffee can be made using a whipped cream canister, but keep in mind that these do not use either of the 2 required items that were mentioned above. Whipped cream canisters use N2O (nitrous oxide) instead of 100% nitrogen. Additionally, the spout doesn’t have an agitator or restrictor plate like what you’d find inside of a stout faucet. So while you may be able to partially replicate the taste and appearance of a nitro coffee, you won’t get the full visual effect and mouthfeel. Just scroll through the pictures on the link to the right and you’ll see that the cascading effect and the crema on top isn’t what you’d usually expect from a proper nitro coffee. You made it past the “faux nitro” headline which means you want to make a real nitro coffee. As previously mentioned, there are 2 required items for nitro coffee and these come at each end of the draft system – 100% nitrogen is the start and a proper stout faucet that contains a restrictor or agitator plate is the end. I should also note that there are a couple additional/optional products that can be used to accelerate and enhance the nitro coffee pours. These additional products will not be used together, they are designed to operate independently of one another. The Quick Cascade Keg Lid helps to infuse the cold brew coffee inside the keg with nitrogen. It does this through the use of a high pressure hose that has a diffusion stone attached to the bottom of it. This accelerates the nitrogenation of the cold brew by introducing nitrogen directly into the coffee, rather than into the headspace of the keg, which is where all kegs introduce gas by design. If used, the Quick Cascade Lid would be installed inside of the corny keg, or in between items #3 and #4 as our gas line would be connected to the Quick Cascade Lid rather than to the typical gas in post on the cornelius keg. Also note that this lid can only be used with cornelius kegs; it cannot be used with sanke style kegs. The NitroNow Nitro Infuser is a newer product that infuses cold brew with nitrogen on-demand, meaning that you’ll be able to serve non-nitrogenated cold brew as a nitro coffee. The Nitro Infuser has 2 inputs: (1) cold brew coffee (2) nitrogen gas. The cold brew and the nitrogen enter the infuser and pass through a series of chambers where the cold brew gets infused with nitrogen and the result that comes out the other side of the infusion module is a heavily nitrogenated nitro coffee. If used, the NitroNow Nitro Infuser is installed between the keg and the faucet by splitting #5 in the list above (the beverage) line. Note that if the Nitro Infuser is used, it will also require an additional gas line input, but it does come with the necessary gas line splitter, so you shouldn’t need to purchase any additional items outside of the infuser. The Nitro Infuser can be used with any existing draft system – this include cornelius kegs and as well as sanke style kegs. Now that we’ve talked about all of the typical components of the draft system, we can start discussing “how” nitro coffee is made. For the purpose of this discussion, we’ll assume we’re using a corny keg and a draft system similar to that pictured on the right. Cold brew coffee can be nitrogenated in a number of ways. I’ll walk you through 3 different ways, two of which were briefly mentioned above. When we first started with nitro coffee, there were no “fancy” items to help infuse nitrogen into the liquid, so we nitrogenated in 2 ways: over long periods of time (24-72 hours) or by shaking the keg. Nitrogen isn’t as soluble in liquids like CO2 is, so it takes a bit more time to be infused. That’s where “shaking the keg” was born in the nitro coffee world. If you talk to anyone who has been doing nitro coffee for awhile, they’ll likely tell you that they used to have to shake kegs in order to get a good, cascading pour. As noted above, the Quick Cascade Lid helps to infuse nitrogen directly into the coffee. The idea behind this item is incorporating nitrogen directly into the coffee – basically shaking the keg, without actually having to shake the keg. An additional benefit of the Quick Cascade Lid is that it works as you pour. When you pull the tap handle and remove coffee from the keg, more nitrogen is released through the diffusion stone, helping to nitrogenate/agitate the cold brew in the keg. This option is the simplest and involves the least amount of time on the frontend. The NitroNow Nitro Infuser handles all of the “magic” as the beverage is being poured. 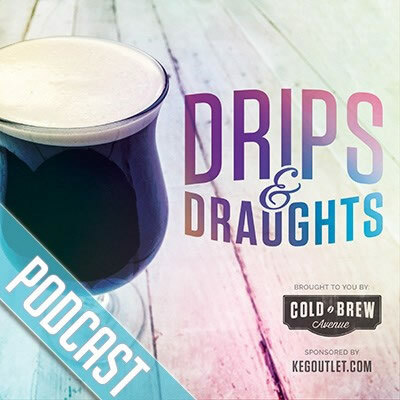 There is no need to pre-infuse the cold brew coffee like the prior to methods because this happens for you as the coffee is traveling from the keg to the tap. As with anything, there are pros and cons to each method mentioned above whether that be time, cost, learning curve, extra time, labor, etc. The method that I prefer may not work for you, so try to weigh the options and pick something that will work into your process and workflow. What does a Proper Nitro Coffee Look Like? Beautiful. Amazing. Enchanting. It can be described in any number of ways, but one thing is for certain. The downward cascade of the nitrogen bubbles and the thick creamy head on the top of the drink give it a unique appearance. A well poured nitro can cascade for 2-3 minutes (or more in some cases) and will settle out to leave a thick, frothy head, almost like a Guinness Stout. A proper nitro coffee pour. As the coffee continues to cascade, the dark ring of coffee seen at the bottom of the glass will slowly make its way to the top, until there is no cascade left and just a thick, rich head. Have any questions? Don’t hesitate to ask in the comments, or reach out via any social media channel.